Playhaven today announced the release of a platform for iOS game developers that makes releasing updates as simple as writing a blog post. While push notifications for games are a common way that developers notify players of changes, Playhaven hopes to cut through the noise by utilizing a dynamic overlay powered by HMTL5, allowing game makers to engage users along multiple fronts, and to do so without having to get code updates from the App Store. Playhaven has created its own backend for developers that allows them to create simultaneous campaigns, stagger notifications, and track the performance of games and features. Essentially it is a powerful CMS for direct engagement between developers and users. Playhaven hopes to solve for developers what it calls the “ranking rollercoaster.” Often when a game debuts it sees an immmediate spike in popularity, and quickly crashes. If the development team is lucky, they can regain interest and eyeballs when they push new features, such as adding new challenges or new levels. This generally means releasing an update, which has to be approved, and can be an extremely labor-intensive process. For small teams this inhibits the ability to work on new games, and for larger production houses, any changes to a popular game require significant buy-in from different layers of management. 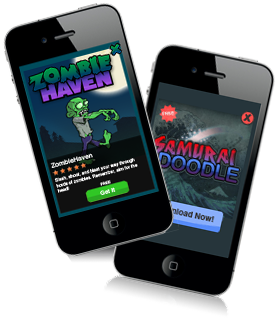 Playhaven wants their platfom to be a Swiss army knife for game marketing and monetization. With its dynamic overlays developers can speed their time to market of new feature rollouts, without having to change their game code. Teams such as Z2Live have been working on similar platform solutions for their own use, says CEO Andy Yang, but he’s confident that Playhaven has got a significant lead over anyone who would attempt to make a similar product for commercial application. The Playhaven platform has a robust set of features and analytics, but here are a few of the quick highlights. Playhaven’s new platform lets developers entice their users with new rewards and incentives that flash upon launch. Developers can maintain engagement by popping quick news into the overlay at launch. Studios can cross-promote their library of existing titles, and Playhaven makes it possible for external developers to get their games in front of potential players, similar to an advertising network. Playhaven recently inked a deal with Glu Mobile, the maker of popular titles such as Space City and Big Time Gangsta. Glu Mobile will now be distributing Playhaven’s solution across it’s entire suite of games. Playhaven’s marketing and analytics tools are also running on three of the top 10 games in the App Store, including popular such as Fruit Ninja. Titles running Playhaven’s integrated solution are currently clocking 170 million game sessions per month.